Spinson Casino – Up to 999 Free Spins! Spinson Casino is a relatively new online casino having launched in late 2015, operating on the Everymatrix platform they are able to offer a vast range of online slots from popular developers such as NetEnt, Microgaming, Nextgen/NYX, IGT and Play’N Go. The main feature that sets them apart from many other casinos is the big emphasis on Free Spins as opposed to the more traditional casino bonuses, with players able to claim up to a massive 999 Free Spins on their first deposit at the casino. The free spins can be played several different popular NetEnt slots including Starburst, Neon Staxx, Twin Spin, Gonzo’s Quest or Wonky Wabbits. What’s more, they offer players 35 Free Spins No Deposit Required just for signing up the casino too, with 30 Free Spins playable on Gonzo’s Quest or Starburst, and the other 5 playable on the selected game of the week, check our Spinson free spins article to keep up to date on the selected weekly slot. Spinson Casino has licenses from the UKGC (UK Gambling Commission), MGA (Malta Gaming Authority) and as such welcome players from the UK, along with a whole host of other countries. Players can expect a different kind of welcome offer at Spinson casino, there are no bonus matches on offer, things are kept very simple with Free Spins on offer with various tiered levels available depending on how much you deposit. As you would expect the offers get better as the amount you choose to deposit increases, with a maximum of 999 Free Spins on offer for players who deposit £/€300 or more. Up to 999 Free Spins on first deposit! Spinson Casino uses the EveryMatrix platform, and as such have access to a massive range of online slots (currently over 500+ different games to play), with the latest slots release being added to the casino in a prompt fashion. All of the major developers are there including NetEnt, Microgaming, Nextgen, Play’N GO, IGT, with several other smaller providers on the NYX platform which includes developers such as Thunderkick and ELK, with several more new developers coming on board soon including Playson. Thankfully there are some very popular filters on offer, allowing players to filter the massive range of slots by provider, as well as a more regular text search which updates the results as you type, and of course, a favourites section so you can save all the best online slots into one easy to find location. Spinson Casino also has a multi-slot function on offer which allows you to play up to 4 different online slots simultaneously! Spinson has a very organised promotional section, with a clickable calendar on offer showing you exactly what is on offer for the entire month allowing you to plan the best days to be playing, and by simply clicking on the relevant date you will have the full details of the offer including any bonus codes required. 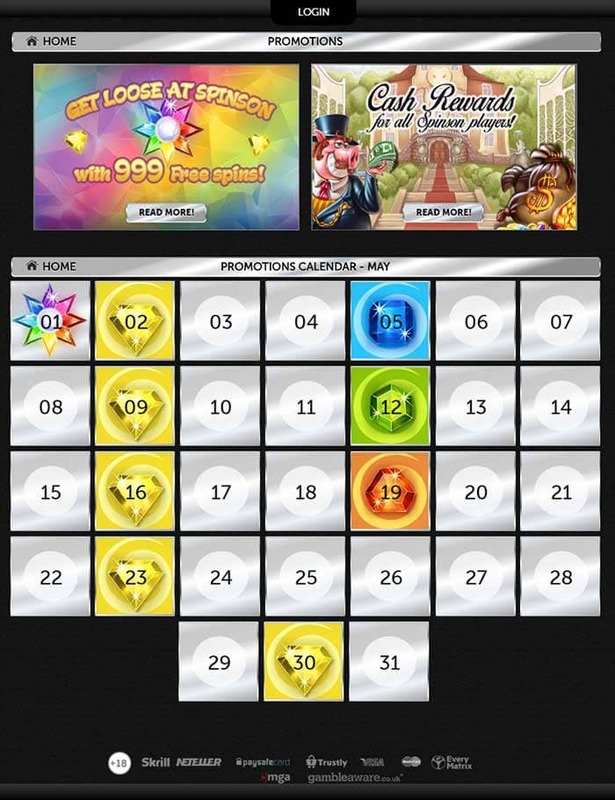 A sample of May 2016’s promotions includes lots of free spins offers, free spins challenges, and free spins bonus codes throughout the month too, as you can probably tell free spins are a massive focus at Spinson Casino! 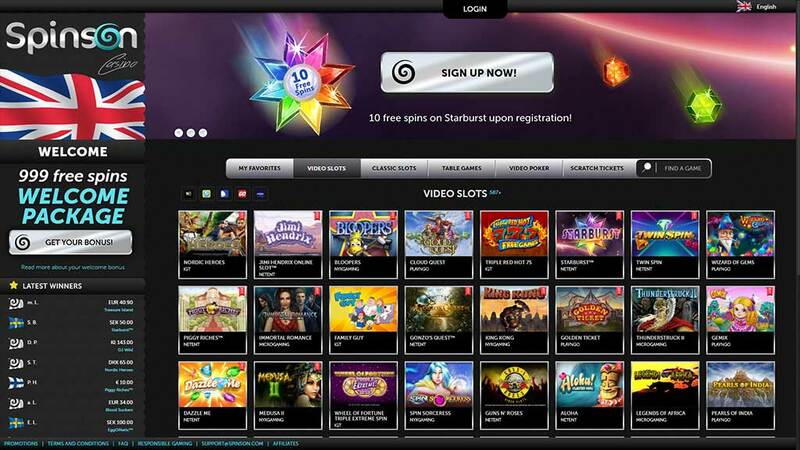 New players registering at the casino from this site can look forward to 15 Free Spins No Deposit required, with 10 Free Spins playable on Gonzo’s Quest or Starburst, and the other 5 are playable on the selected slot of the week (at the time of writing this is Fruit Shop but changes on a weekly basis), what you can expect is that it will be a popular NetEnt slot. Tip – Play the Free Spins on Gonzo’s Quest, being a 20 line slot the Free Spins are worth double the value of Starburst Free Spins! Up to 999 Free Spins on offer! 35x Wagering requirement on any free spins winnings. The free spins can be played on any of the following Starburst, Neon Staxx, Twin Spin, Gonzo’s Quest or Wonky Wabbits. Tip – Play the Free Spins on Wonky Wabbits, this is a 30 line slot so the Free Spins are worth more (0.30 per spin) than the other choices. To get the most value from the free spins follow our tips, or simply do not play Starburst with your free spins as it offers the least value to the player! When playing through the free spins, you can only have 1 active wagering bonus visible at any time, so for example if you were to play the 10 Free Spins on sign-up then the additional 5 straight away after, you will not see the winnings from the 2nd set of Free Spins until the first bonus is money is either cashed out or lost. Our advice – Play through 1 set of free spins at a time – then attempt to make the wagering requirements and cash the money out before attempting further free spins wagering! At the time of writing, Spinson Casino operates its customer support via email only operating from 8 a.m until 2 a.m, but there are already plans in place to extend customer support to the more usual live-chat feature in the coming months (hopefully live by Q3 2016). Since Spinson Casino operates on the EveryMatric platform there are a wealth of popular deposit and withdrawal methods on offer, which include Visa, Master Card, Neteller, Skrill, Eco Card with the addition of Bank Transfers as a withdrawal method also. There’s nothing too groundbreaking about the design of Spinson Casino but everything works just fine, the major focus of purely Free Spins offers as opposed to casino bonuses is a refreshing change and makes it very easy to manage your play with no bonus wagering to worry about until you use the free spins. We are a big fan of the “Filter slot by provider” option for casinos running many different titles, and the one present at Spinson works perfectly. We definitely like the calendar based promotional section, which makes it very easy to plan when the best days to deposit are, along with some nice rewards on offer through a decent player loyalty system. The main negative at the time of writing is the customer support via email only, hopefully, the introduction of the more commonly used live-chat feature will be a great boost to the casino, due to be introduced in August/September 2016. Overall, something a little different to try, and should definitely appeal to players who enjoy Free Spins!